These home made candles are environmentally safe featuring a non-toxic zinc wick that burns virtually soot free for approximately 40 hours. To protect your wood furniture, we recommend placing candles on cork coasters or marble or glass surfaces. These candles and soy tarts/melts are only available at craft fairs. Please see the calendar below for dates and locations. 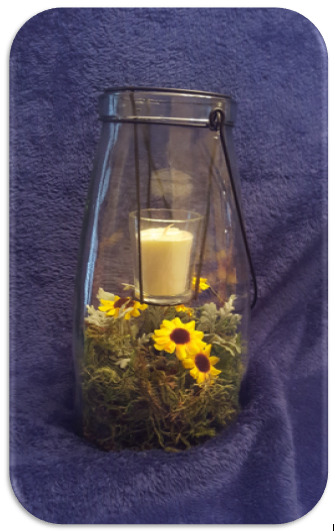 Handcrafted votive candle displayed in a decorative glass candle jar. This new item will be featured at the spring shows. Just starting to plan for 2019 so check back often! Select handcrafted soy tarts and accessories are also available.